Splendor surrounds you in northern Italy, from its glittering lakes and majestic mountains to its opulent villas brimming with artistic and botanical masterpieces. 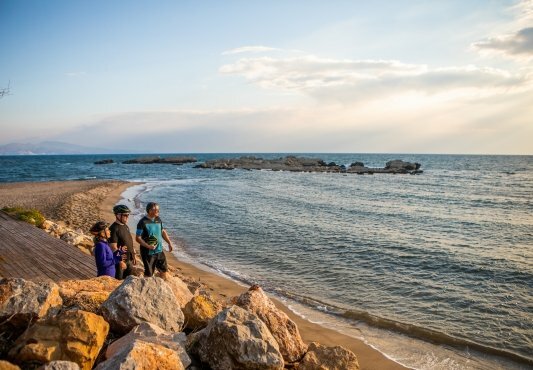 Absorb it all, as you amble cobbled streets, a lakeside promenade and a pilgrimage trail. 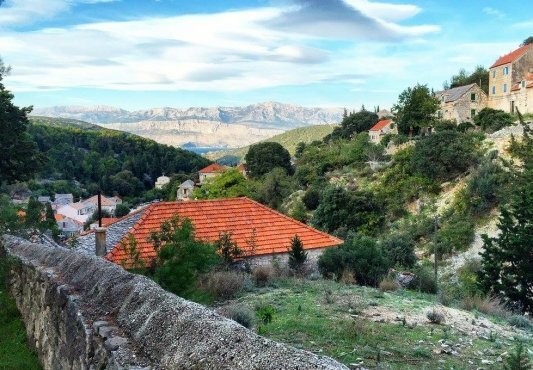 You’ll visit pastel-colored towns, medieval villages and devotional sites, and take in breathtaking views from a mountaintop, with easy downhill trails. 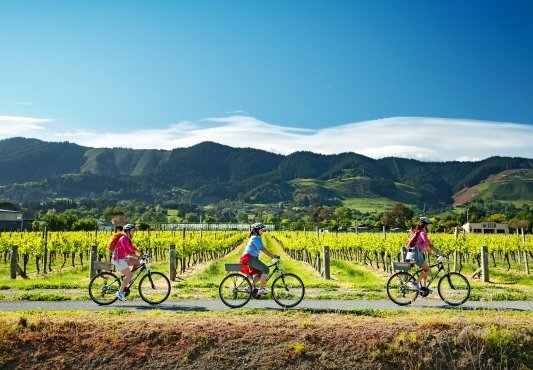 Special events, such as lunch in a cave, a picnic at a cheese-producing farm and a wine tasting dot your path. And complement your walks with rides by boat, train and cable car. 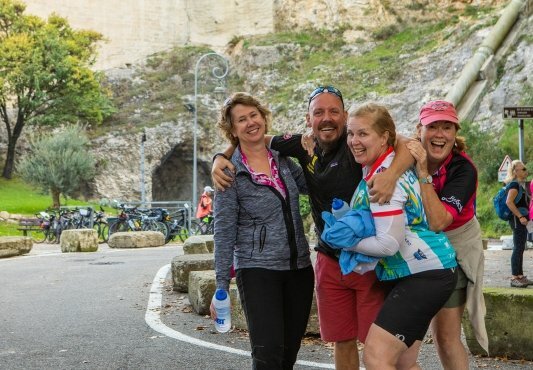 This tour features a combination of easy uneven terrain and paved roads mixed with some short steep hills. Walks are in open countryside and small cities, sometimes on uneven footpaths over grass and soil pathways and cobbled streets. It is ideal for enthusiastic beginners and experienced walkers. It is important to wear appropriate shoes with excellent tread to ensure the perfect grip on uneven and rocky terrain. 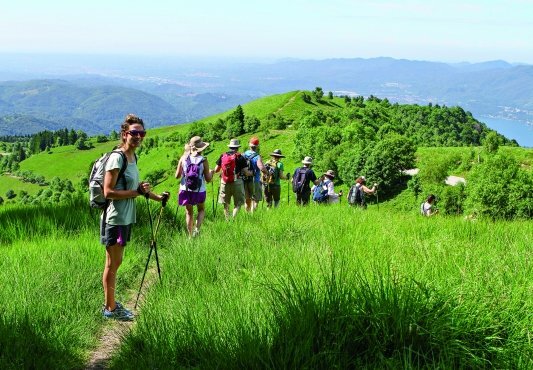 We plan both longer optional walks and short easy options for those who want to spend more time on their own exploring the cities and surroundings. Be prepared to use ferry and motorboats extensively for our transfers. Both morning and afternoon or evening options are available every day. Several of the walks require a transfer from our hotel to the start of the walk. Van support is limited due to distinctive features of the region. Some vehicle support is provided where possible. Please note: Be prepared to make transfers by ferry and motorboat. Any luggage will be transferred by vehicle. Upon arrival at Malpensa Airport in Milan, Italy, a VBT representative meets you and helps you transfer (approximately one hour, depending on traffic) to our centrally located hotel in Como. The rest of the day is yours to explore and dine at leisure, using the VBT City Information as your guide. You may also opt to dine at the hotel restaurant, a great option according to VBT guests’ feedback. If you are going to be delayed meeting our transfer representative for more than 15 minutes due to delayed or lost luggage, please let our Airport staff know by calling or sending a text message to +39 334 221 88 93. Our drivers are generally able to wait for up to 45 minutes from the time your flight lands, after which you would be responsible for your own transfer. You may also contact our One Call travel assistance to advise of your delay and they will contact our transfer service. Please note: If you arrive early, your hotel room may not be available until 2:00 p.m., in which case you may store your luggage with the reception desk. VBT Air Package and Pre-Extension guests: Meet your VBT Trip Leaders, who will be wearing VBT staff garments, at 8.45 a.m. in the main lobby. Please come to the meeting dressed in walking gear and carrying your backpack. 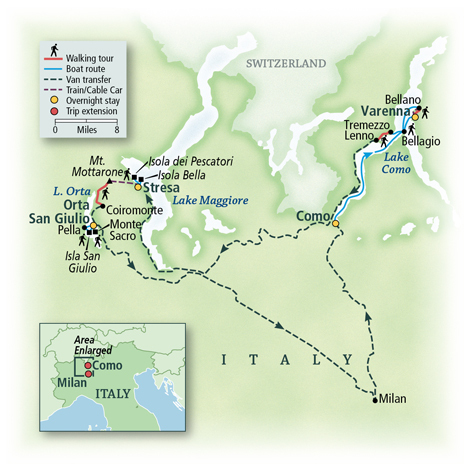 Our Trip Leaders will hold an orientation and safety briefing before we embark on our first walk, a stroll through the city center of Como to its harbor (approximately 0.6 miles / 1 km). Here, you’ll board a boat bound for Bellagio, admiring the sumptuous private villas and small villages lining the shores of Lake Como throughout our two-hour cruise. The views of the surrounding mountains are magnificent. Once in Bellagio, choose from among the many local restaurants for lunch on your own. We’ll then regroup for a walking tour of the town, known for its 12th-century basilica, cobblestone streets and stone staircases. Your route follows the waterfront up to Punta Spartivento and ends at Villa Melzi. Built in 1808 to honor Napoleon, the villa is famous for its romantic English-style gardens, which welcome visitors each spring with a profusion of azaleas and rhododendrons. Later in the afternoon, a short boat ride brings us to Varenna, our final destination for the day—and our home for the next two nights. This picturesque village welcomes us with its pastel-colored houses lined up along the narrow shore between mountain and lake. We walk a narrow gangway suspended over the water, below an arch of pine trees and oleander branches to a flight of stairs, arriving at Varenna’s main square and our hotel. Settle in before gathering for a welcome reception, followed by dinner at the hotel. Daily Options: Morning: 0.6-mile city walk. Afternoon: 2.2 or 3.0 miles mostly flat. After breakfast, we take a 4-minute train ride to the nearby village of Bellano. Here you’ll cross the waterfall and dramatic Pioverna river gorge, before starting our walk along the Sentiero del Viandante, or “Wayfarer Trail.” A former mule path that connects the various towns and villages on Lake Como’s eastern shore, it was once the area’s only road. As you walk, you’ll pass through sleepy villages such as Regolo, and many chapels scattered along the way that testify that the path was once used as a pilgrimage way. Our walk ends in the fascinating medieval hamlet of Vezio, known for its ancient stone houses and 13th-century castle that we visit. Our lunch stop today is a very special place, the Crotto del Pepott. A crotto is a kind of rural tavern, but originally crotti were only natural caves penetrating within the remains of ancient landslides. The constant cold air current circulating inside made them ideal refrigerators for preserving foods like cheese, wines, and local bresaola. 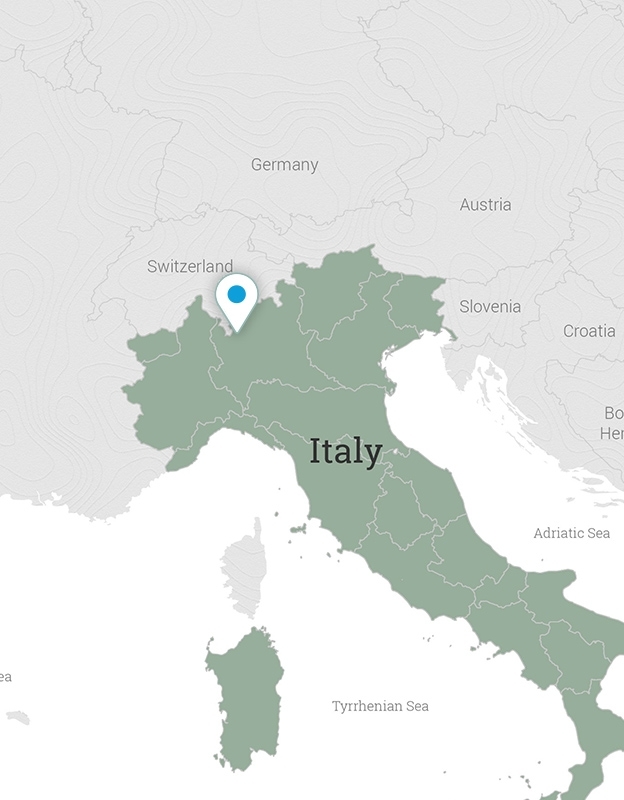 You will be treated with delicious pizzoccheri, the trademark dish of the Valtellina valley and a popular meal in the mountains of northern Italy. Early this afternoon, a short walk or shuttle takes us down to Varenna, where you’ll have the entire afternoonat leisure to relax or explore on your own. 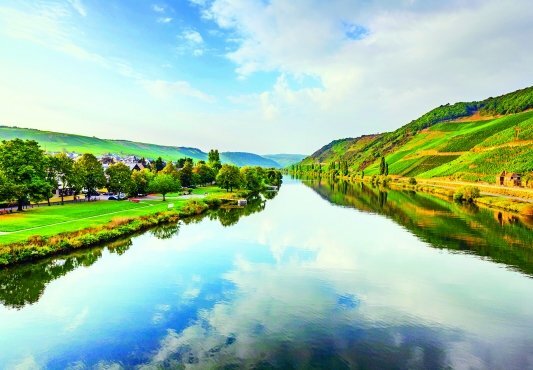 Perhaps you’ll visit Villa Monastero, whose gorgeous gardens extend down to the lake, or walk to the nearby Fiumelatte—the shortest river in Italy, at just 2,297 feet (700 meters) long. In the summer, the waters of Lake Como are warm enough for swimming, and Varenna’s only beach is just across from our hotel grounds. In the summer, you may also enjoy the hotel swimming pool. Daily Options: 4.6 miles on gradual ascent and descent and one initial notable ascent on steps. Surfaces mix cobblestone alleys, paved roads, and dirt paths with some rocks and steps. Early this morning, you’ll ferry to Lake Como’s opposite bank to discover Tremezzo and Villa Carlotta. The 17th-century villa is named after Charlotte, the daughter of Princess Marianne of Nassau, who purchased the property in the mid-1800s and presented it to Charlotte as a wedding gift. Charlotte’s botanist husband expanded the existing landscape, including an exotic corner laid out according to the dictates of English gardens. In spring, the villa’s grounds are bursting with more than 150 varieties of azaleas and rhododendrons. Inside the villa you’ll admire a collection of fine paintings, and the grounds are adorned by an impressive collection of Romantic sculptures. After some time on your own to explore the gardens or sip an espresso in the villa’s café, we return to the lakeside promenade to walk an easy route to Mezzegra, admiring more elegant villas, scenic views of Bellagio on the opposite shore and the glorious Alps. You’ll next set off to Lenno, where a weekly market provides a colorful snapshot of local life. You can choose to ferry to Lenno, or venture there on foot, walking an easy-to-moderate route out of Mezzegra, with a stop at the church of San Abbondio. Situated just a few feet above the lake, Lenno offers sweeping views of the area. After lunch on your own, follow our Trip Leaders into the gardens of Villa del Balbianello, located on a steep promontory overlooking Lake Como, and the setting for famous movies such as Casino Royal and Ocean’s Eleven. You will visit the villa interiors with a local guide. Presenting a different type of Villa, this was the house of a local rich entrepreneur and explorer between 1974 and 1988, Guido Monzino. The rooms include art collections and unusual memorabilia of his international expeditions, as well as Italian furniture from the eighties. Later, you’ll shuttle to Stresa on the shores of Lake Maggiore, and settle into your next hotel. Tonight, choose from among several nearby trattorias or our hotel’s restaurant for dinner on your own. Daily Options: Morning: 2 to 3.6 miles on flat lakeside promenade, cobblestone alleys, and paved roads with one gradual ascent. Afternoon: 2.1 miles on a paved path along the lake shore and on well beaten dirt paths with gradual ascent and descent. We begin the day with a closer look at Isola Bella, the most famous of Lake Maggiore’s Borromean Islands. A private motorboat brings you here from Stresa—a brief journey of five minutes—and you’ll be treated to panoramic views of Palazzo Borromeo, the opulent baroque and neoclassical palace occupying the island. The sprawling villa was built during the 17th century by the wealthy and influential Borromeo family, who continue to use its upper floors as a summer residence today. Accompanied by a local guide, we’ll discover room after lavish room, featuring paintings and sculptures by Lombardy artists, elaborate Flemish tapestries and stunning Murano glass chandeliers. The sumptuous interior is complemented by the equally elaborate terraced gardens outside, which are filled with oleander, magnolias, camellias and lemon trees, and gently slope down to Lake Maggiore. Before reaching the gardens, however, you’ll descend a staircase from the main house into a cavernous grotto comprising six rooms, in which every inch of space is covered in splendid mosaics wrought with pebbles, seashells and pink marble. Back in Stresa, you’ll enjoy lunch on your own and time at leisure during the afternoon. Peruse Stresa’s many gourmet shops and boutiques selling leather goods, or stroll among flowery grass islands and lush parks on the town’s long lakeside promenade. Cool off and pamper yourself at our hotel, perhaps relaxing on the rooftop lounge, at the spa, or in the swimming pool. Or pay a visit to the Grand Hotel des Iles Borromées, just next door to our hotel, which has welcomed countless famous guests, from kings and maharajas to Nobel prize-winning author Ernest Hemingway. The afternoon options are endless: Villa Taranto and its big gardens with rare plants or the extraordinary religious complex of Santa Caterina….our guides will facilitate and offer more tips! We regroup late this afternoon and set off in a private motorboat for the most picturesque island in the Borromean archipelago, Isola dei Pescatori (“Fishermen’s Island”), which we’ll explore with our guides. The sunsets are especially lovely here, and you’ll have time to savor one while sipping a glass of local wine before enjoying our included dinner at a lakeside restaurant. Daily Options: Morning: 2 miles in and around the Palazzo Borromeo on paved paths with some stairs, and along Stresa’s lakeside promenade. Evening: 0.9 miles on Fisherman’s Island. This morning, a 20-minute cable car ride takes you up 3,500 feet to the summit of Mount Mottarone. From here, you’ll enjoy breathtaking 360-degree views of Lake Maggiore, Lake Orta, Lake Varese and other smaller lakes, all framed by snowcapped Alps. You’ll walk downhill along easy footpaths, mostly unpaved and covered with soft grass, dirt tracks and uneven terrains to Coiromonte. 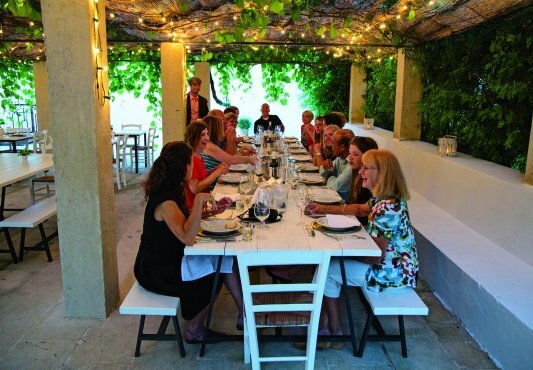 Here, you’ll visit a small farm known for producing excellent cheese, which you’ll have the opportunity to sample during a picnic lunch prepared for us by the farm’s owners. Our feast also includes local specialties made with organic vegetables grown in the owners’ garden. If you prefer, you can shorten the walk by taking our shuttle to Coiromonte instead of walking all the way. Early this afternoon, you’ll shuttle to the village of Orta San Giulio, where we offer an easy short walk in the city and along Lake Orta to our hotel. Later, check into our hotel and enjoy free time. The grounds include a large, attractive garden and a terrace on the sunny side of the lake, with mountain views. Daily Options: Morning: 2.2 or 4.6 miles gradually descending on dirt paths in a mountain environment. Gradual uphills in the long option to Coiromonte. Afternoon: 1.2-mile city walk on cobbled pedestrian streets. This morning’s walk brings you along the shores of Lake Orta and up into the surrounding hills for a visit to enchanting Monte Sacro, a UNESCO World Heritage Site. A devotional complex dedicated to St. Francis of Assisi, it consists of more than 20 chapels filled with frescoes and life-sized terra-cotta figures depicting the saint’s life. You’ll enjoy views of Lake Orta below as you walk in the shade of tall, leafy trees and drink in Monte Sacro’s magical atmosphere. You’ll return to Orta San Giulio and enjoy a tour of this pretty little village with our Trip Leaders; then have lunch at a local enoteca where you’ll taste Piedmont wines and local specialties like bagna cauda, a fondue-like dip made with butter, garlic and anchovies and served with crostini, truffles and vegetables. After lunch, you’ll board a private boat for a five-minute cruise to Isola San Giulio. 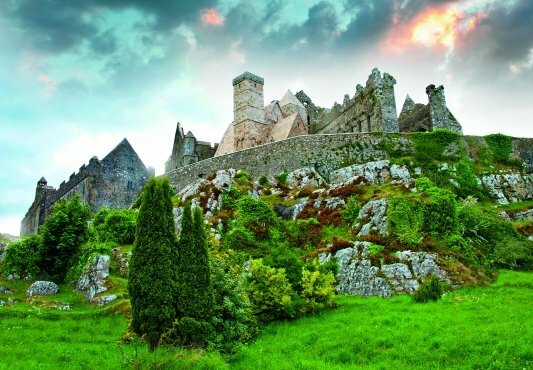 The tiny island is named for the fourth-century saint who introduced Christianity to the region. The beautifully frescoed basilica is the hundredth, and final church founded by Saint Julius. You’ll have time to navigate La Via del Silenzi (“The Way of Silence”), a footpath that encircles the island. Afterward, you can return to the hotel, or cruise to Lake Orta’s western shore for a final easy to moderate scenic walk that ends in the picturesque village of Pella. During tonight’s farewell dinner, you’ll enjoy fine Italian specialties at our hotel’s gourmet lakeside restaurant Teatro Magico. Daily Options: Morning: 2.1 miles on a flat lakeside promenade with gradual ascent through cobblestone alleys and paved streets; and along rolling paved roads and dirt trails. Afternoon: 3.2 miles on dirt paths in the woods, with gradual ascent, on cobblestone alleys, and on a notable steep staircase downhill, to end on a paved road. After breakfast, you’ll transfer to Milan, where our Walking Vacation ends. VBT Air Package and Post Trip Extension guests: You’ll arrive at our Milan hotel around 10 a.m. and have the rest of the day at leisure. Our VBT representative will answer your questions and offer an orientation walk to help you discover the many treasures of Milan. Our hotel is a short walk from the convent of Sta. Maria delle Grazie, a UNESCO World Heritage Site famous for Leonardo da Vinci’s fresco The Last Supper. Please note: If you’d like to visit the convent, reservations are necessary and should be made in advance. For more information, visit http://www.vivaticket.it. You can also walk to the pedestrian-only shopping district of Via Dante, right outside the hotel; explore the wonderful Duomo cathedral; browse the boutiques of the Galleria Vittorio Emanuele; and visit the Palazzo Reale or “Royal Palace.” In the evening, you can stroll to Brera, the art and fashion district, to people-watch in one of the city’s many trendy cafés. If you are looking for a guided walk, contact our recommended guide in advance. You’ll find more details in VBT’s Milan City Information. If you have chosen the independent Post-Trip Extension to Milan, you’ll remain at this hotel for three nights. After breakfast* this morning, transfer to Malpensa Airport (approximately 60 minutes, depending on traffic) for your departing flight**. Please ensure that you are ready in the hotel reception area at the designated time. VBT-Walking-Vacation-only guests: Meet your VBT Trip Leaders, who will be wearing VBT staff garments, at 8:45 a.m. in the lobby of the Alberto le Due Corti hotel (Piazza Vittoria 12; Tel. +39 031-328-111). Please come to the meeting dressed in walking gear and carrying your backpack. Please note: Transfer to the hotel is on your own. A taxi from the railway station costs about 10 euros. If your arrival at the hotel is scheduled for later than 8:45 a.m., or if you are delayed, please contact the hotel and the hotel staff will pass your message along to our Trip Leaders. VBT highly recommends flying to Italy at least one day before the tour begins; this allows you to rest and recover from jet lag before you begin sightseeing and walking. Daily Options: Morning: 2.1 miles on a flat lakeside promenade with gradual ascent through cobblestone alleys and paved streets; and along rolling paved roads and dirt trails. Afternoon: 3.2 miles on dirt paths in the woods, with gradual ascent, on cobblestone alleys, and on a notable steep staircase downhill, to end on a paved road. VBT-Walking-Vacation-only guests: Your trip concludes at our Milan hotel at approximately 10 a.m. From here, you can pursue your own travel arrangements. The hotel is located in central Milan on Via Cusani and is right next to the Cairoli metro station. Located in the city center near the medieval walls of Como, this hotel is a historic palace. Youre sure to mingle with locals because the oldest and most charming café in town belongs to the hotel, located on the ground floor under a portico. The hotel has a small swimming pool and restaurant. Its location makes it easy to stroll into the city center, to browse the cafés and shops, or visit the cathedral. The lake promenade is a half mile away. The Una Hotel is centrally located a half mile from the Duomo and Galleria Vittorio Emanuele. Via Dante, which leads to the pedestrian-only shopping and theatre district, is down the street. You can also stroll to the nearby Brera district and Sta. Maria delle Grazie Convent, home to The Last Supper by Da Vinci. The Sforza Castle art museum is across the street. If you want to explore further afield, Cairoli metro station is nearby. The Una hotel chain is well known for comfort, design and its attentive staff. Four hundred years ago, this property on the shores of Lake Orta served as a convent and then transformed into a hotel. Today, the combination of modern and historic features lends the property a unique style and flair. Amenities include a gourmet restaurant and terraced lakeside sun deck with swimming pool. The hotel is just a short walk from Orta San Giulios pedestrian-only zone. This historic hotel, located on the shores of Lake Como in the medieval village of Varenna is designed for a queen: after the young Queen Victoria who stayed here in 1838, the hotel was renamed in the English monarchs honor. Today, the Hotel Royal Victoria retains its 19th-century ambiance but boasts fully modern amenities, including an outdoor pool and an elegant restaurant with an outdoor terrace overlooking Lake Como. Each of its 43 air-conditioned rooms features a telephone, satellite TV, minibar, in-room safe and private bath with hair dryer. This elegant hotel is located in the heart of Stresa on the Lake Maggiore promenade within easy reach of the beach. From the rooftop Sky Bar, sun terrace and swimming pool, you will enjoy open panoramic views of the lake, Mt. Mottarone, and the Borromean Islands. The hotel also has a restaurant, bar, and health club with a spa tub. It offers free WiFi access in public areas. Each of its air-conditioned rooms features a terrace or balcony, telephone, pay-per-view TV, minibar, in-room safe, and private bath with hair dryer. Upon arrival at Malpensa Airport in Milan, Italy, a VBT representative meets you and helps you transfer (approximately one hour, depending on traffic) to our centrally located hotel in Como. The rest of the day is yours to explore and dine at leisure, using the VBT City Information as your guide. The area is full of wonderful options for shopping and dinner. You may also opt to dine at the hotel restaurant, a great option according to VBT guests’ feedback. This morning, enjoy an Italian breakfast and then meet our VBT representative at 9:00 a.m. at the hotel. Our local guide will be happy to answer your questions and offer a pleasant orientation walk. On clear days our guide will take you on a funicular ride up to Brunate to enjoy spectacular views of the region, and then enjoy a leisurely walk back downhill. In the afternoon, explore Como on your own. Continue to explore Como on your own. Or perhaps take a 30-minute train ride to Lugano and spend some time discovering this beautiful Swiss city. Your Como Representative will facilitate your excursion by providing a train schedule and information. Today you have the entire day to explore this alluring city. Across the square from your hotel is Sforza Castle, built in 1300 by the Austrians. This huge fortress is home to a museum whose collection includes Michelangelo’s Pietà Rondanini, the artist’s final sculpture. VBT City Info package describes a self-guided Milan tour that you can do on your own. The opportunities for discovery are endless today. If you are a shopper, enjoy browsing Milan’s chic designer boutiques and dining in some of its many fine restaurants. Or take a train to the nearby town of Bergamo, home to the Carrara Academy, one of Italy’s finest art galleries. As you plan your time here, keep in mind that most museums in Italy are closed on Mondays. 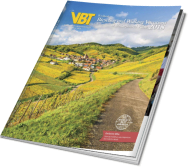 Please use the VBT City Information packet to make the most of your stay. If you haven’t been to nearby Lugano, this lakeside town is another good place to spend the day. The train connections from Milan’s central station are frequent and the ride is short.